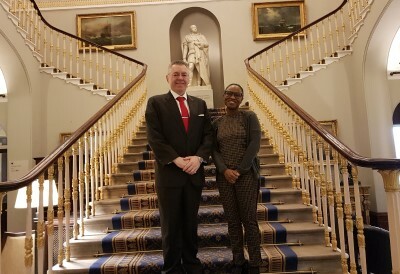 David Stringer-Lamarre, MD of FortisCL, within his role as Chairman of the Institute of Directors, London Region, was pleased to meet with Kady Doumbia, President of the Côte d’Ivoire Chamber of Commerce in Great Britain (CCCGB). There was an exchange of information regarding UK-Côte d’Ivoire businesses and trade opportunities between the two countries. There was a discussion about the upcoming Business Conference and Forum, which will be held at the Institute of Directors, Pall Mall. This will showcase British and Ivorian products and services to open the way to new business frontiers. The Institute of Directors, Central London Branch, will be a support organisation. The Côte d’Ivoire Chamber in Great Britain in collaboration with the British Government and the DIT is organising a Trade Mission in London, to promote Côte d’Ivoire as an investment destination for British companies and investors.